Home »Posts Tagged "iOS Developer"
This infographic illustrates the key features of iOS 7 and it helps app developers understand the importance of developing apps that give latest app user experience with iOS 7. 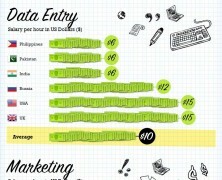 Based on oDesk ‘s aggregated data for online jobs’ salary demand, this report from Staff.com gives the whole picture of how labor hour for distance working is valued around the world. 4 of the most popular fields are examined including Web Development, Data Entry, Marketing and Mobile App development.